While staying at the Mariner Resort you may like to take a walk, view wildlife or fish off the Drakes Island or Wells Jetties. Just 2 ½ miles from the Mariner Resort. Built between 1961 and 1962 the Jetties extend 1,200 to 1,300 feet seaward. The Jetties protect the Wells harbor from storm surges, harbor boats, and is the main stem of the Webhannet watershed. Here you can experience Maine’s coastal wildlife. Harbor seals, Cormorants, ducks, crabs and starfish are among some of wildlife you will see. 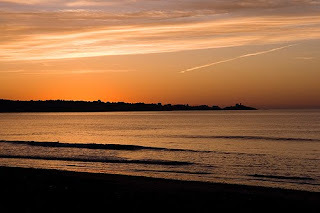 Fishing is also common sight at the end of the jetties so, come fish for Stripers, relax, view wildlife or for you early risers watch the sun rise over the Atlantic. What’s a New Shell Lobster? Maine is famous for its new shell lobster -- tender, delicious lobster that you can break open with your bare hands. 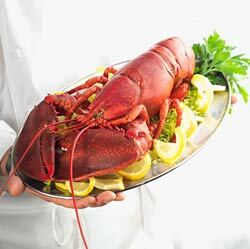 This delicacy is available only during harvest time, so make sure to ask for new shell lobster if you're in New England between July and October. Anyone who has had to resort to a hammer to get the meat from a hard shell lobster can easily understand one of the benefits of a new shell. You can usually break the shell open with your bare hands to access the tender meat inside. This means that you spend more time enjoying your delicious meal and less time wielding tools. Although lobster aficionados are divided in their preferences for tail meat versus claw meat, they tend to agree that new shell lobsters are a delicacy not to be missed. After the lobster has shed its thick old shell and is sporting a larger new shell, the meat is at its most flavorful and tender. Making sure when you're visiting us at The Mariner Resort you ask us the best places to eat lobster, and save a claw for us! 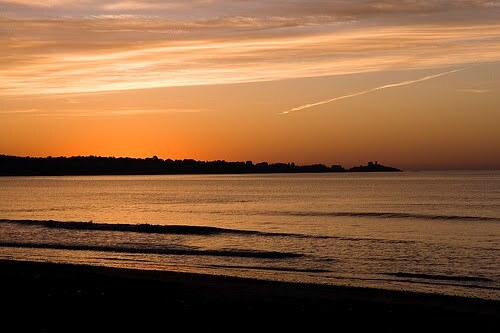 The mouth of the tidal Ogunquit River separates three miles of white sandy beach from the craggy granite ledge which dives into the Atlantic. Everyone knows that the Atlantic is cold (even in the summer! ), but did you know that the Tidal River is up to 15 degrees warmer when the tide is going out? Millions of visitors have walked the Marginal Way, a scenic cliff-walk that meanders along the ocean for over a mile. Ogunquit has something for everyone ..... Theater lovers flock to the many playhouses for the summer stock performances, many with the actual Broadway performers in the lead roles. Visitors rave about the assortment of galleries, boutiques, gift shops, and day spas. Discriminating diners have an abundant selection of fine restaurants to satisfy nearly every taste - including lobster! Recreation enthusiasts love Ogunquit because our front yard is an ocean and our backyard is the "Vacationland" known as Maine. You can try deep-sea fishing departing from Perkins Cove, cast a rod into the river, even learn about trapping lobster with a licensed captain, take a cocktail cruise along the shore, or play a round of golf at some of New England's top rated courses. Sailing, sea kayaking, surfing and whale watching are also popular activities as well as hiking or biking on nearby Mount Agamenticus or the Wells Reserve at Laudholm Farm, as well as the Rachael Carson National Wildlife Preserve. Some come and visit The Mariner Resort and enjoy 'The Beautiful Place By The Sea'! A sand dune is a mount, hill or ridge of sand that lies behind the part of the beach affected by tides. They are formed over many years when windblown sand is trapped by beach grass or other stationary objects. Dune grasses anchor the dunes with their roots, holding them temporarily in place, while their leaves trap sand promoting dune expansion. Without vegetation, wind and waves regularly change the form and location of dunes. Dunes are not permanent structures. Sand dunes provide sand storage and supply for adjacent beaches. They also protect inland areas from storm surges, hurricanes, flood-water, and wind and wave action that can damage property. Sand dunes support an array of organisms by providing nesting habitat for coastal bird species including migratory birds. Sand dunes are also habitat for coastal plants. The Ogunquit dunes are home to 141 species of plants, including nine rare, threatened and endangered species like the Piping plover. Surrounded by lovely gardens and landscaping, The Mariner offers a wide range of accommodations on the Ogunquit Tidal River. Come relax in our 56-foot outdoor pool and hot tub or our indoor pool with scenic vistas. Get a workout in our Fitness Room or enjoy our outdoor amenities like our volleyball and bocce court area! Our accommodations include comfortable immaculate rooms and 2-room suites that feature free WIFI, cable television, refrigerators, microwaves, and individually controlled A/C & heat We invite you to make The Mariner Resort your home in Southern Maine. Our staff is ready and happy to answer your questions and give suggestions to make your vacation as relaxed and as memorable as possible.